Splitting up the boiling and bottling processes have made everything more manageable, as they can both take a long time, especially at higher volumes. Water boils at 212 degrees, and syrup boils at 219. I got my near-syrup up to a boil and it was already at 215. You have to keep an eye on the pot as it tends to foam up just before it's ready, and can overflow resulting in a sticky, marriage-damaging, stove-top mess. Once it hits 219, it needs to be filtered before bottling. This remove impurities, "sugar sand", and "niter", which are all by-products of boiling sugar. 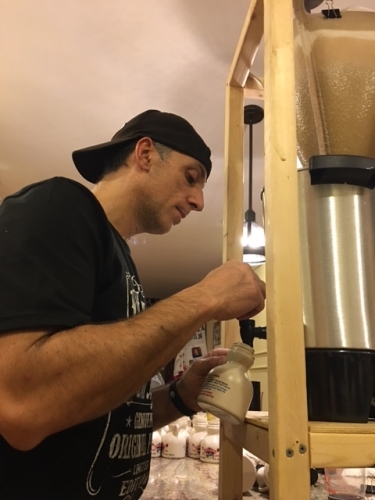 I use a rig that holds the cone filters and the syrup drains into a coffee urn that I can plug in to keep the syrup warm while using the spout to more easily dispense into jugs. It's good to have some extra hands at this point, and Dannielle did the capping as well as narrating any syrup drips or spills. Both kept her quite busy. With so much syrup, I had to rinse out the filters and reheat a few times to keep things moving along. I ended up with 3 gallons which was close to what I predicted. 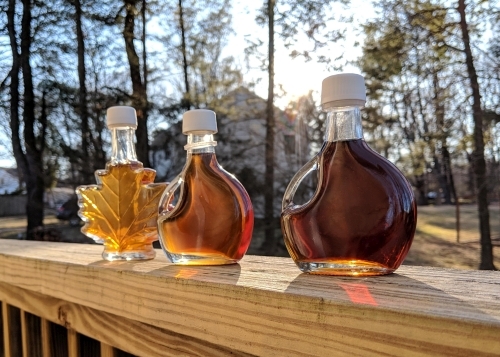 The syrup was darker as expected later in the season, and the bolder flavor was sampled and enjoyed. Next year I may ramp up to some pint jugs as well as the half-pints.